Royal Dutch Shell has shut three oil flow stations in Nigeria's Niger Delta region after a pipeline was sabotaged, a company spokeswoman has said. Analysts expect the group to report a quarterly profit of $2.9 billion (£1.8 billion) on Thursday, a 40% drop over the same period last year. This would take its annual profit to $13.4 billion, down 57% on the $31.4 billion it made in 2008 when the oil price hit a record of $147 a barrel.The results will come in stark contrast to rival BP. Analysts expect it to post a profit of $4.8 billion for the quarter, about 75% better than the same time a year ago. The jump is largely thanks to the overhaul initiated by Tony Hayward since he took over as chief executive in 2006. Voser is carrying out a raft of other cost-cutting measures, including the sale of large swathes of its Nigerian oilfields, a plan revealed in The Sunday Times last month. Royal Dutch Shell is to sell its stake in three Nigerian oil-producing licenses, underlining its new chief executives cool stance towards what was long a mainstay of the groups operations. In recent weeks fresh rumours have circulated that Shell was seeking to dispense of Nigerian assets worth billions of dollars. Royal Dutch Shell is likely to endure more humiliation at the hands of BP this week, when it posts profits an estimated $1.7bn lower than its rival. Is Iraq’s oil strategy too ambitious? BAGHDAD, Jan. 29 (UPI) — The chief executives of two of the world’s oil giants have been waxing lyrical about helping Iraq quadruple its oil production over the next decade, but questions linger about whether it can be done. Some energy industry experts believe that given the plethora of problems that the Iraqi government of Prime Minister Nouri al-Maliki is having to deal with, Baghdad is being way too ambitious. One of BAE’s former confidential agents, Count Alfons Mensdorff-Pouilly, was today charged by the Serious Fraud Office with bribery over arms deals. He was remanded in custody in London. It is the first ever criminal case brought during long-running corruption investigations into the British weapons manufacturer, which began more than five years ago after disclosures in the Guardian. 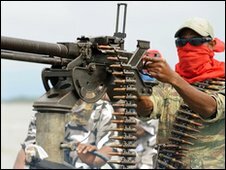 A militant group in Nigeria’s oil-rich Niger Delta says it is ending the ceasefire it declared last October. Jomo Gbomo, who said he was a spokesman for the group Mend, said it did not believe the government would restore control of resources to local people. Mend has demanded that residents be given a greater share in profits from oil resources and land. It warned oil companies to prepare for what it called an all-out onslaught against installations and personnel. Shell, whose production has dropped below 3 million barrels of oil equivalent a day, has cut 5,000 jobs. Its also reorganized management by erasing 20 percent of senior posts. Tony Hayward, the chief executive of BP, said that his company hoped to increase production in the Iraqi field it has agreed to modernise from one million to three million barrels a day over the next 10 years. His counterpart at Royal Dutch Shell, Peter Voser, made a similar commitment on the two fields Shell is involved with. Jan. 29 (Bloomberg) — Royal Dutch Shell Plc, Europes second-largest oil company, may need to cut more jobs this year to control operating costs as a recovery in energy demand waits until the second half. A book first published in 1996, “PAYING FOR THE PIPER”, provides more evidence of the dark side of Royal Dutch Shell, which also reflects on its current Chief Ethics & Compliance Officer: Mr. Richard Wiseman. DAVOS, Switzerland, Jan 28 (Reuters) – New technologies to extract gas from shale rock have altered the U.S. energy outlook for the next 100 years, Tony Hayward, chief executive of BP (BP.L), said on Thursday. Jan. 28 (Bloomberg) — Royal Dutch Shell Plc, Europes second-largest oil company, plans to continue record spending this year in its search for oil and gas. We need to keep investing throughout the cycle, Chief Executive Officer Peter Voser said at the World Economic Forums annual meeting in Davos, Switzerland, today. Jan. 28 (Bloomberg) -- Hess Corp., the fifth-biggest U.S. oil company, is in talks with Chevron Corp., Woodside Petroleum Ltd. and Royal Dutch Shell Plc to convert gas from its fields in Western Australia to liquid for export. In a separate investigation, the Department of Justice is looking at whether former Interior Secretary Gale Norton used her position to steer three of the leases issued in 2007 to Royal Dutch Shell PLC, her employer after she left the federal government.